When my sister bought her new house she needed to fill it with some furniture. Luckily for her she has a sister (aka ME!) 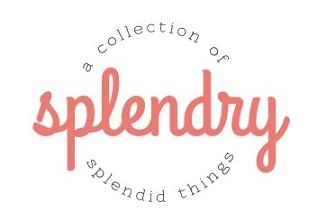 who enjoys shopping, finding deals and redoing furniture. So when she told me she was looking for side tables, a coffee table, and an entry table I went to work. I found these beauties at a garage sale for…get ready for this…$25 for all three!!! I couldn’t believe it either and of course I couldn’t say no! 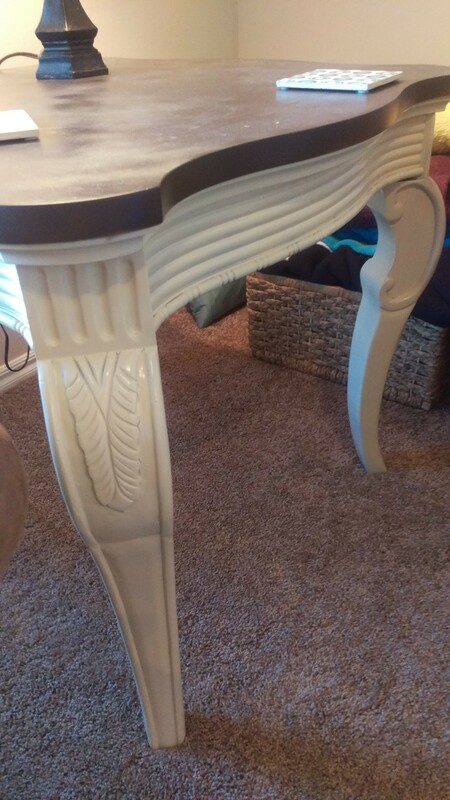 They were awesome solid tables with no structural damage so it was a great find. Then I was at a flea market and found this little beauty for only $25! Four tables for $50- yes, please!!! My sister loved them and told me how she wanted them to look. 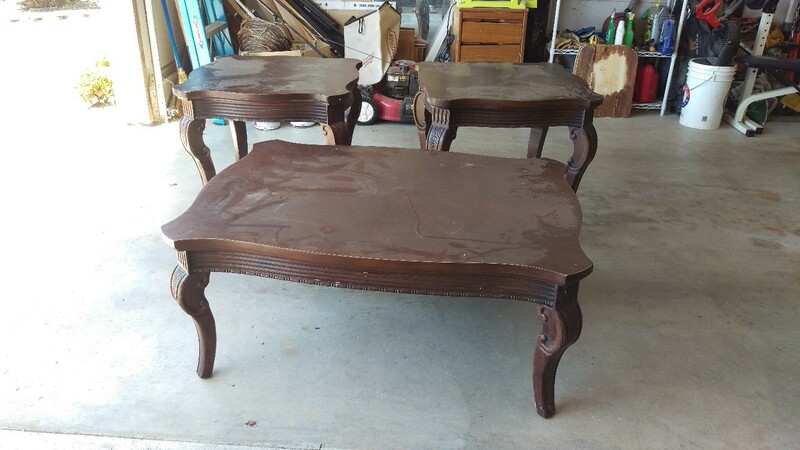 She wanted cream legs and a brown top on the side and coffee tables. I said OK and we got to work. 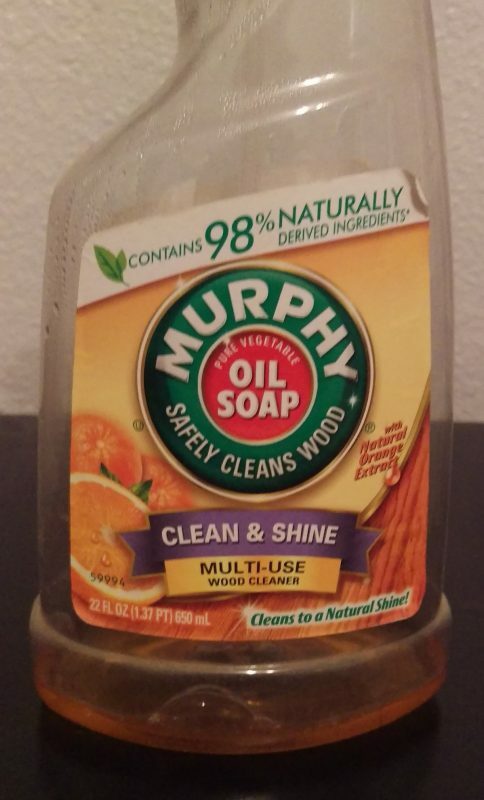 First we cleaned off all the table with my favorite cleaner Murphy’s Oil Soap. 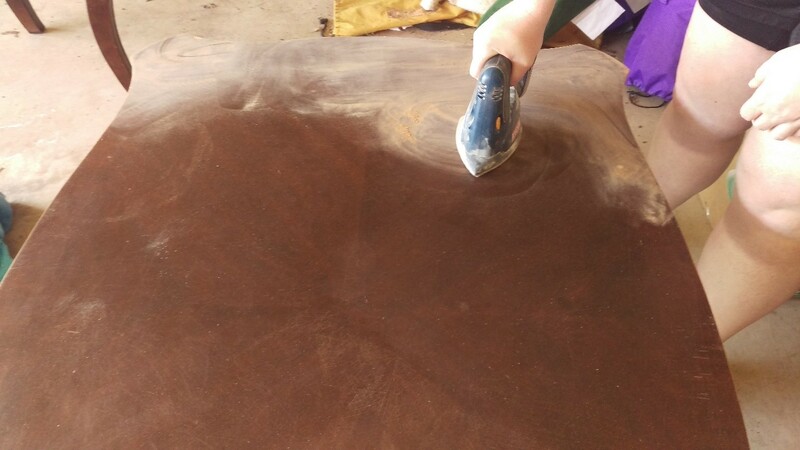 Then we started sanding the tops of all the tables. I originally thought I could sand off the finish and re-stain but I wasn’t having much luck. In hind sight I probably could of stripped the tops and re-stain that but we decided to do an easier solution. We were able to sand down the stain and scratches so that was a plus. We wiped off the tops again after we sanded using Murphy’s Oil Soap. Now we were ready to paint. Since we were going to be using several colors on these pieces we went with spray paint instead of chalk paint to save some money. 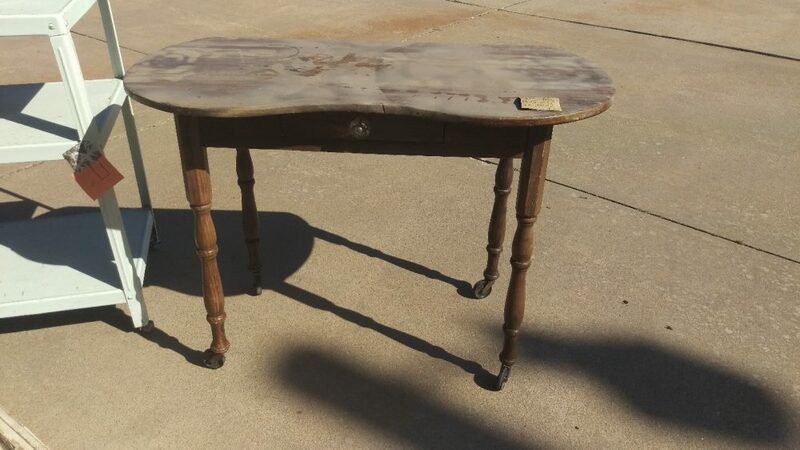 So that is the question: To spray paint or use chalk paint?! In my opinion if you are using multiple colors use spray paint. 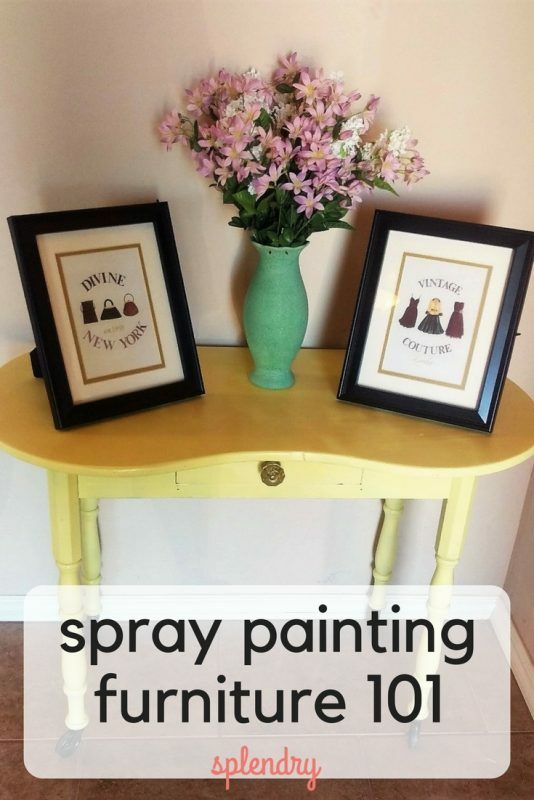 Chalk paint is great but can add up if you are buying several colors. Spray paint is cheap and you have tons of choices. I also think spray painting is faster and pretty straight forward. 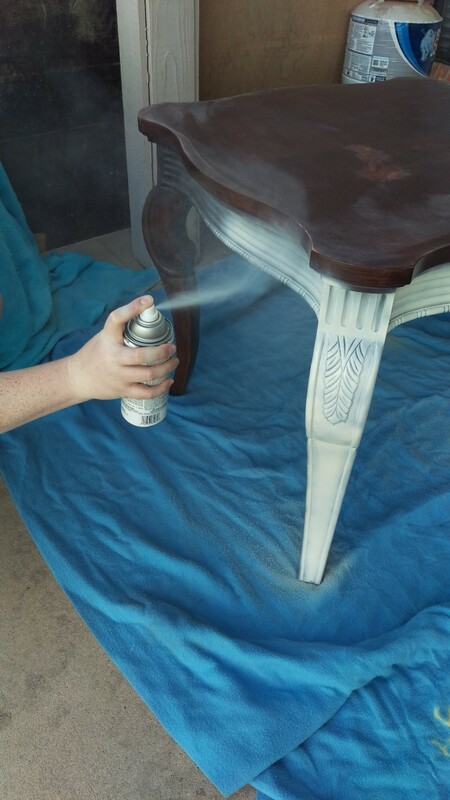 When you are applying two colors on a furniture piece always start with the lighter color first. 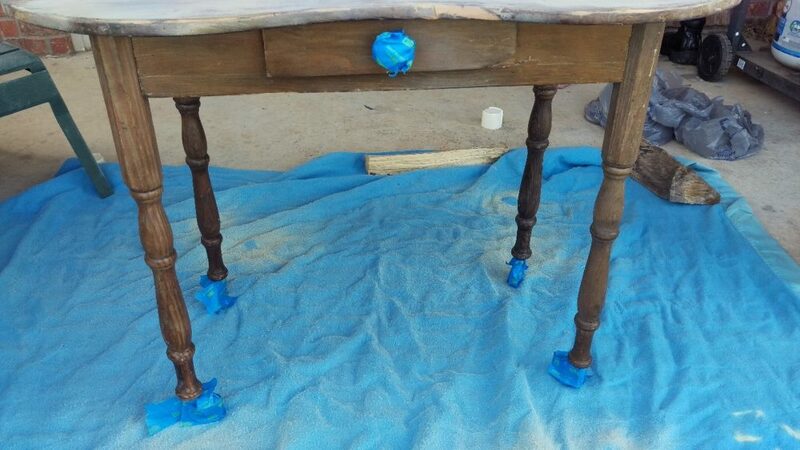 We used Gloss Honey Vanilla by Valspar on the legs. Make sure you don’t hold the spray paint too close to the surface your painting. If you do this will cause drips to occur. If you hold the spray paint too long in the same place it can also cause drips. The good news if you do cause drips you can wipe them up right away and spray again. Gloss vs no gloss, primer or no primer? Which do you choose? I like the look of gloss on furniture so I say yes to gloss especially on wood furniture. As for the primer question, most pieces will need a primer so why not simplify your steps and start with the primer mixed in! 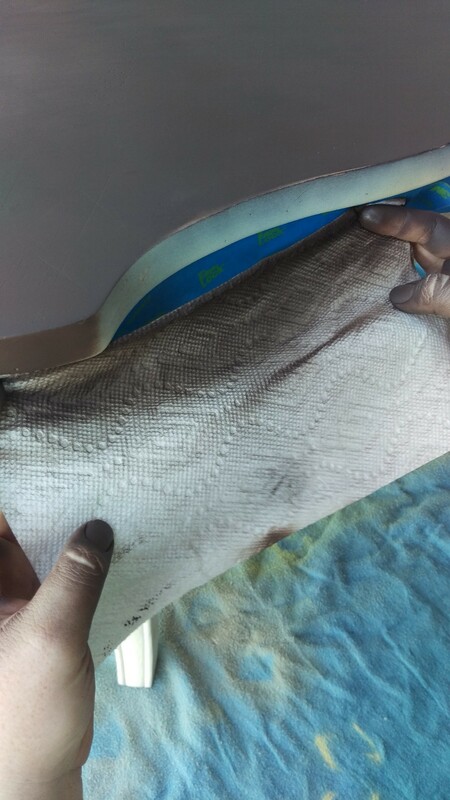 Primer will give you a better coverage on your pieces. On these tables we did two coats of spray paint on all the legs and then let dry. While the side tables and coffee tables were drying we moved on to our entry table. 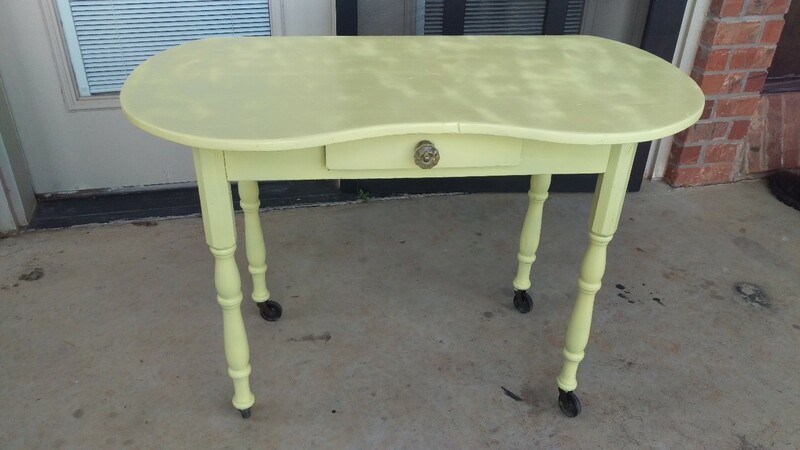 This table we did in a cool yellow. 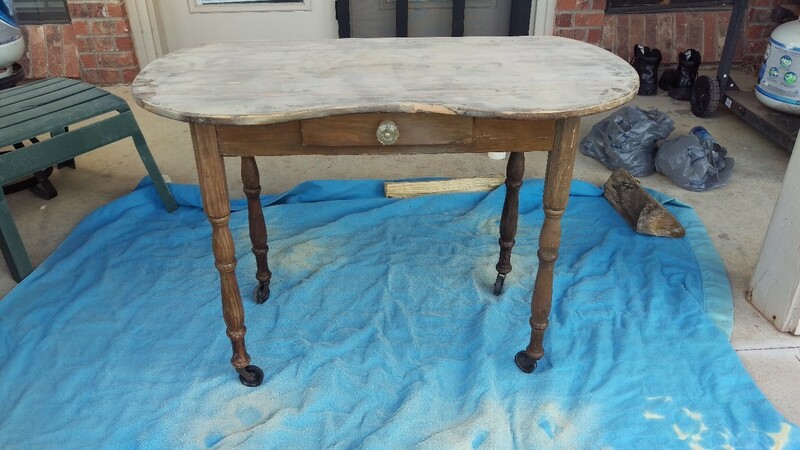 We taped off the wheels of the entry table and the drawer knob and sanded the top of the table. We wiped off the top with Murphy’s Oil Soap and then we were ready to spray paint. 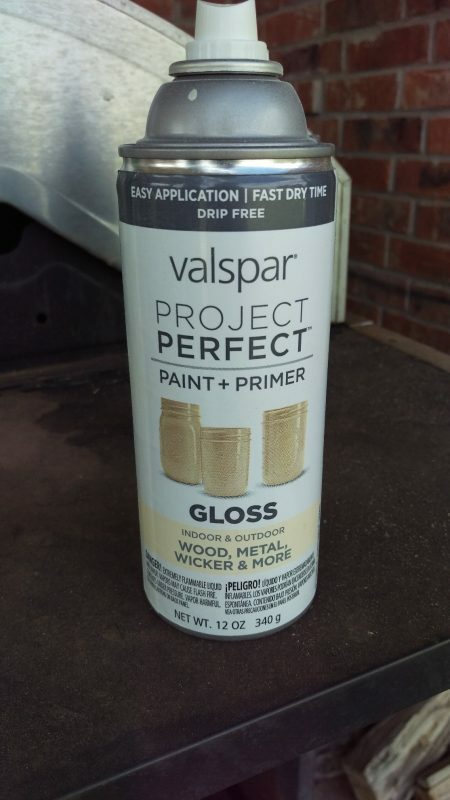 We used Valspar Color Radiance (we couldn’t find this color in gloss so we got a gloss finishing spray to use as the last coat). We removed the drawer and sprayed that separately. 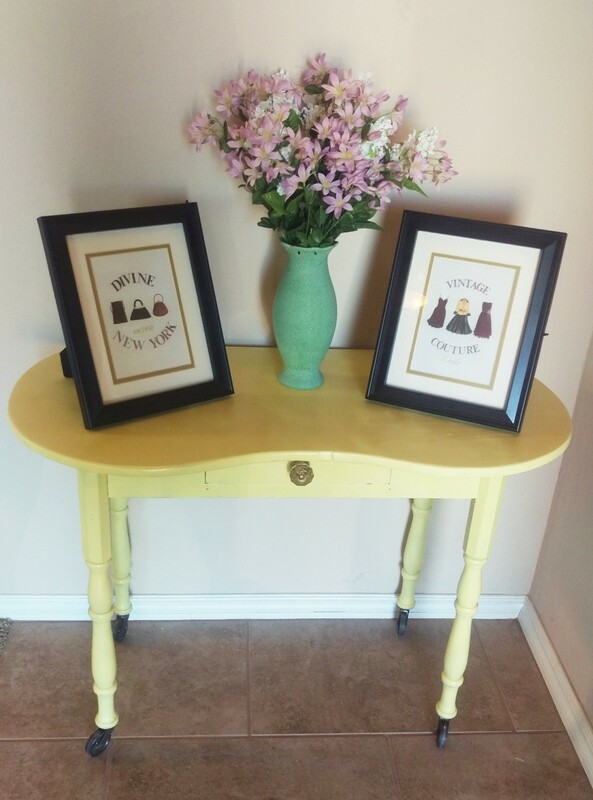 The entry table took two coats of this yellow and then we let it completely dry. Now we were ready to spray paint the top of the tables. We applied tape around the edges to protect the bottom that we sprayed cream. For the tops we used flat Labrador brown by Valspar. To spray the edges I sacrificed my sister’s hands and she held a paper towel over the legs to prevent any additional spray. Don’t worry, spray paint does come off in the shower! We immediately removed the tape and touched up any areas we needed to. 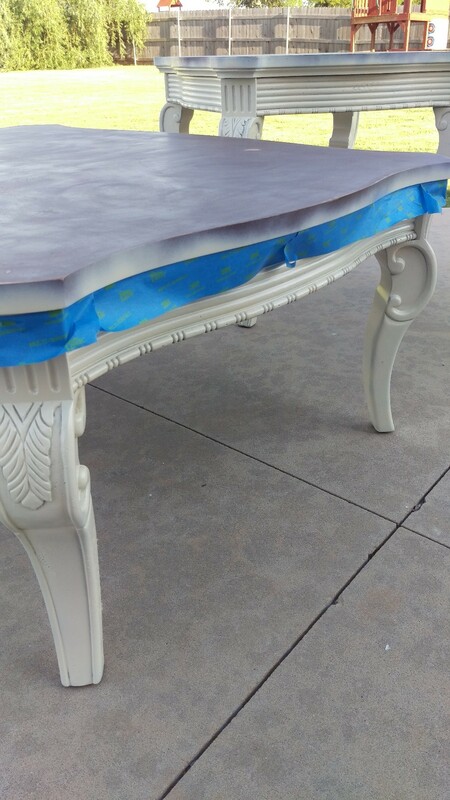 Since we could only find flat paint for the yellow entry table and the brown on the top we applied a clear gloss spray paint to seal them both and give a great finish. This project took a couple of hours to complete and I thought they turned out pretty good. But more importantly my sister loved how they look in her house! Let me know how your next spray paint adventure goes! Those look great! Wish I could have them in my house! Thanks for the tips! You did a great job on those! & what a bargain. I love a good deal. Really cool project. I used to do this kind of thing with my mom when was younger. Great pics.